This is a guide to show you where to enter your client's insurance information into the system. The Insurer box is where you will choose the client's insurance company from your database of Insurers. If you need to add a new insurer to your database, click on "manage insurers" Here is more information on how to do that. The FECA number is used in cases of Federal Workman's comp claims. Generally this box will be left blank. TIP: In certain instances Medicare requires you to enter the word "NONE" into box 11 to show in good faith that you verified the client does not have another policy primary to Medicare. In those cases you can enter "NONE" into this field to satisfy Medicare requirements. This is the name of the Policy Holder's employer. If this is an employee policy the employer should be listed on the client's card. You can enter the client's co-pay information here. 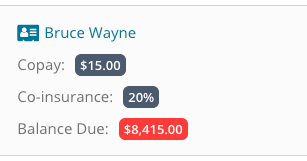 This will prompt the client's co-pay to appear on the Agenda, as well as on the invoices. This is your contracted rate with the insurance company. Note: this box is informational only and will not automatically add a contractual to your invoices. This is the field where you can enter your client's deductible amount after verifying insurance benefits. Field does not automatically update but must be manually updated. Will show how much of the deductible is still left to be met. The most your client will have to pay for covered services in a plan year. After they spend this amount on deductibles, copayments, and coinsurance, their health plan pays 100% of the costs of covered benefits. A calendar year deductible, which is what most health plans operate on, begins onJanuary 1st and ends on December 31st. Calendar-year deductibles reset everyJanuary 1st. A plan year deductible resets on the renewal date of your client's plan. co-insurance is a percentage of the cost for a health service or prescription drug paid by a member after they have reached their deductible. This amount will show on the agenda. If the client's service requires and Authorization you can enter in the authorization number given. This is the name of the policy holder. It is informational only and does not transfer into the claim. Please see the Insured ID section below for information on the policy holder. To "Accept Assignment" mean you are accepting the Payers contract rate. If you in network with the insurance you must mark "Yes"
To "Authorize Payment to Provider" means you want the payment sent directly to you. If you are billing Out of Network you can choose how you want to handle these options. Choosing "Yes" means that the client has authorized you to release any medical information necessary to process this claim. This includes diagnosis, procedure, and notes if requested by insurance. Note: TheraNest does NOT send your records to insurance. If a payer requests medical records they would need to be printed/dowloaded and faxed or mailed to the payer. Client Condition Related to an Accident? This is a field in which the staff member who verified the insurance benefits can be selected. If this field is marked as "select one" either that option was not chose or the client updated it via the client portal. This is the client's relationship to the Insured ~ or policy holder. TheraNest requires that Policy Holder information is complete before sending claims. 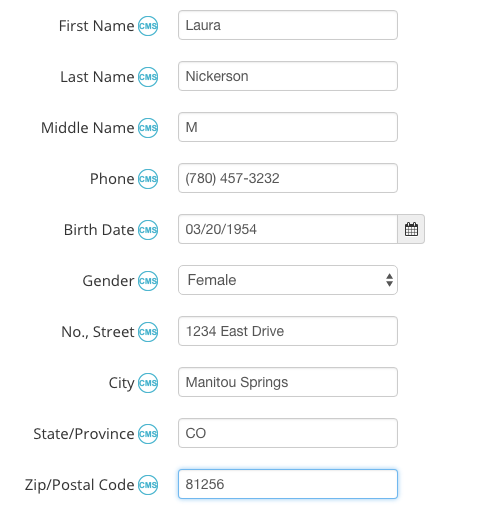 TIP: Be sure to complete the Policy Holder's gender field. The "Undefined" gender entry often causes rejections.